Understanding that nearly 30% of SIGGRAPH attendees attend this event â€“ and only this event â€“ to make decisions about which brands to work with, our strategy was to create a unified experience that encompassed trade show floor, conference speaking and online activities. We set out to create a provocative message to promote interest in AMD's solutions and then provide a payoff to that through the brand experience. In partnership with Advanced Micro Devices, Inc. (AMD), Video Display Systems (VDCDS) recently exhibited a new immersive display environment for multiple Commercial and Military uses. 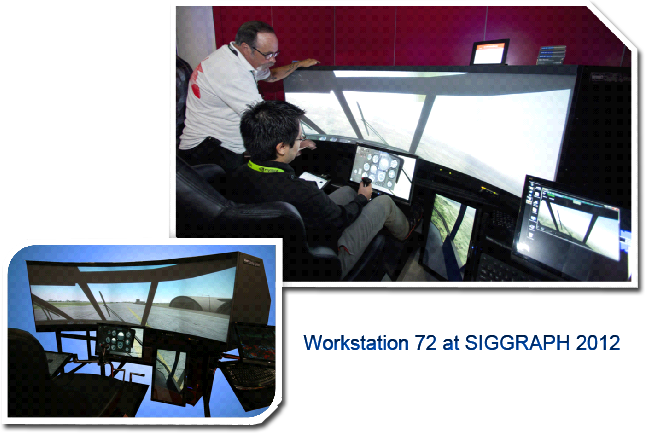 The new concept training systems was demonstrated running Bohemia Interactive Simulations VBS2 and a single seat HELIMOD provided by Ryan Aerospace as a basic helicopter training simulator. The â€œWorkstation72â€ is a self-contained, curved, wide screen (72â€ W x 24â€ H) comprising five high quality LED Solid State projectors with an operating life in excess of 30K hours. In addition the Internal, customizable PC (Windows® 7 / 64 bit OS) is capable of supporting the main displays as well as additional multiple add-on monitors with touch screens.